I usually search for the dress code when I am about to visit a new country. Being from India I cannot go really wrong as we are conservative in our dressing sense. But the advice I see often is done without any photos. I have now made it a habit to do a post on the dress code myself after coming back from a new country. But I do it with pictures, after all seeing is believing. 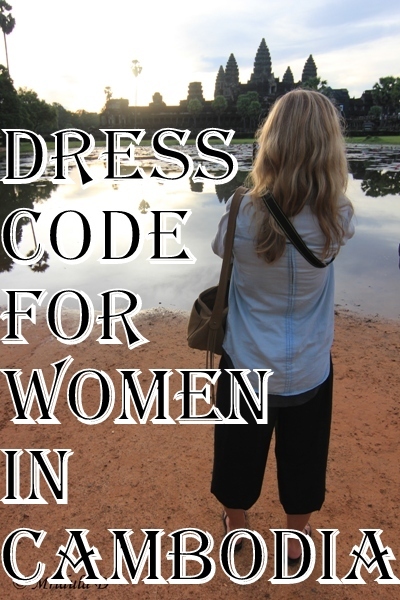 So here is my take on dress code for women in Cambodia. 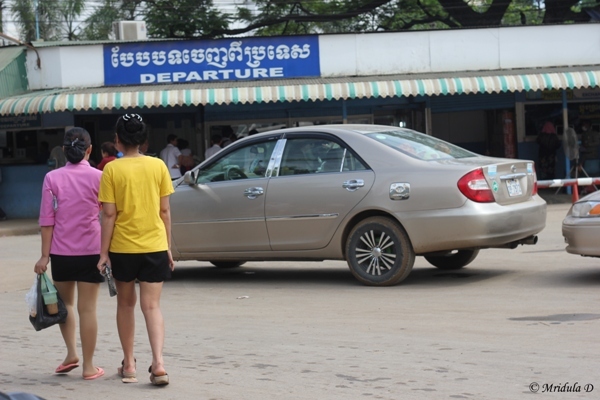 We crossed into Cambodia via the Aranyaprathet Border between Thailand and Cambodia. 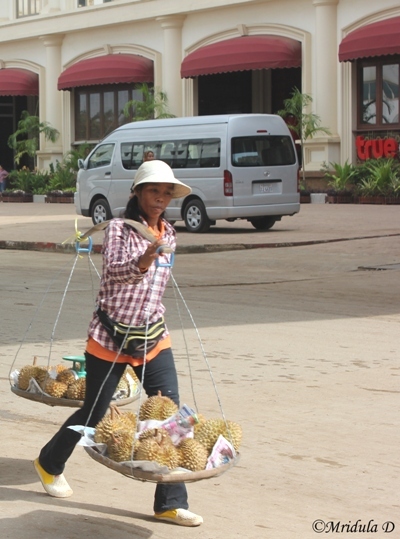 As soon as you enter Cambodia it feels a bit like India, a bit chaotic. 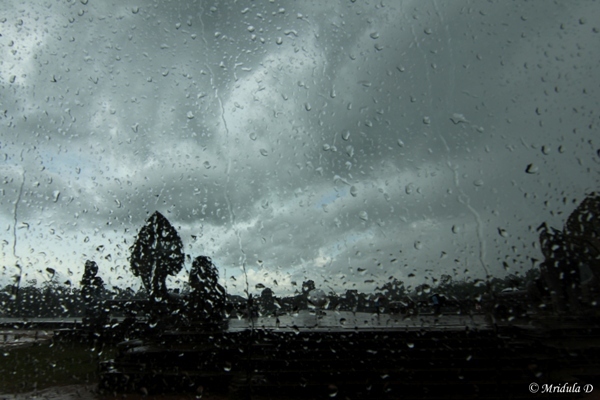 While we were waiting for our van to arrive to take us to Siem Reap I went clicking. Coming from Bangkok I thought the locals were a bit more conservative in their dress. Both men and women used this kind of head gear, probably to keep the sun out. I am not easily fazed by summer but here it was humid too. I still took it quite well. 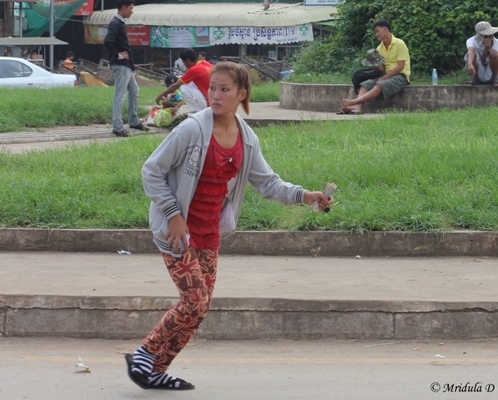 Not sure why the girl was using long sleeves, was it because of culture or was it to avoid sunburn. In India too women can wear long gloves to keep the sun out. Then came these lovely girls telling me not all girls wear full length trousers and shorts were also fine. There shorts look identical, wonder if they bought it from the same shop? I guess from whatever I saw the local women wore t-shirts and trousers but cover up more. 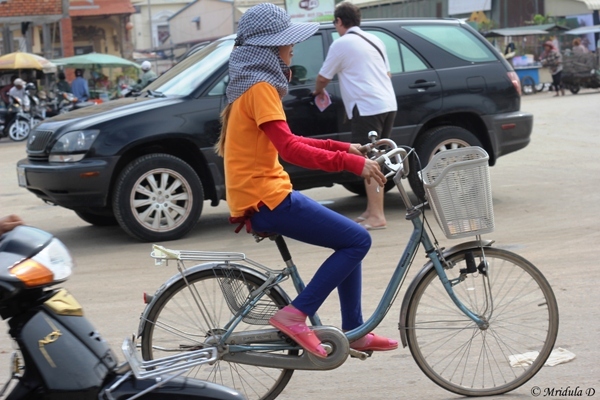 But there is more to dress code in Cambodia, there is the temple question as well. 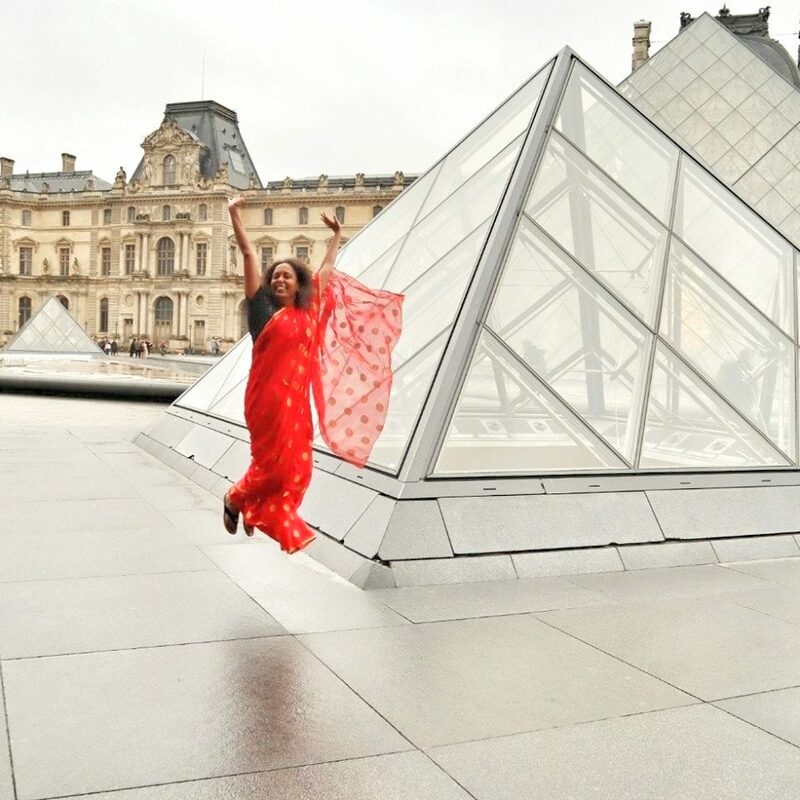 So what do you wear when you go visiting temples? 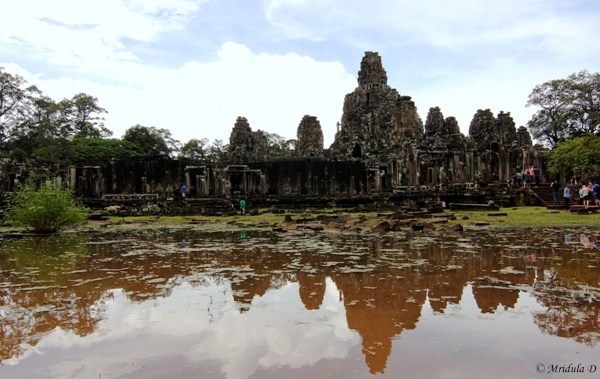 I visited three temples at Siem Reap, Ta Prohm, Bayon and of course Angkor Wat. I thought Angkor Wat was the only one out of the three that had a dress code. Here at Ta Prohm, anything was fine. Whether it was respectful to the local tradition is another question. 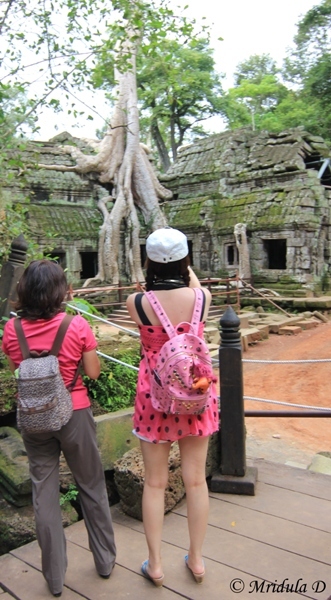 No one seem to be bothered in the least about what you were wearing at Ta Prohm and Bayon. 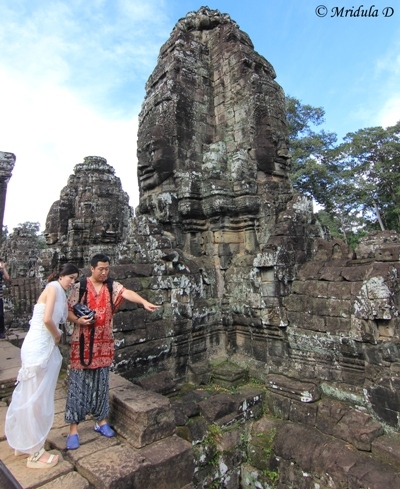 I even saw a girl in her wedding dress at Bayon. I know you and I are not going to wear a wedding dress at Cambodia but if you wanted to apparently you can! I usually like to click my monuments without people. 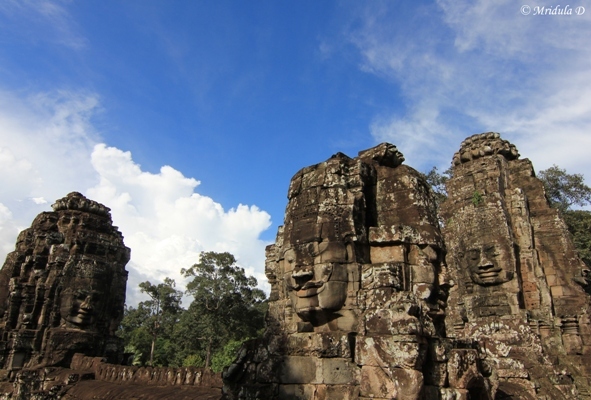 But at popular places like Bayon and other Angkor group of temples it is a game of patience. When I run out of it I start clicking people as well. 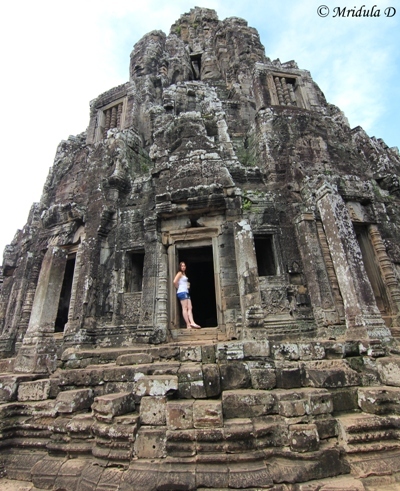 So here is another tourist wearing shorts at Bayon. And here is a bunch of people outside Angkor Wat. Outside this temple it is still fine to wear shorts. This photo was taken just after the sunrise. But they expect you to cover your knees and shoulder at Angkor Wat. 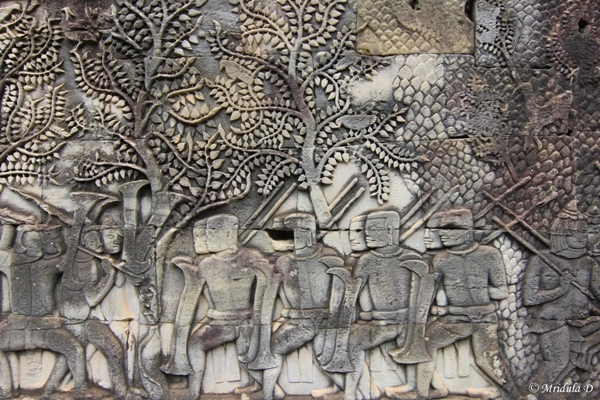 This is what is expected of us when we visit the Cambodian temples. That we cover the knee and the shoulder. So this tourist got it absolutely right. The weather wants us to go for shorts and sleeveless dress but is this too much to ask for? 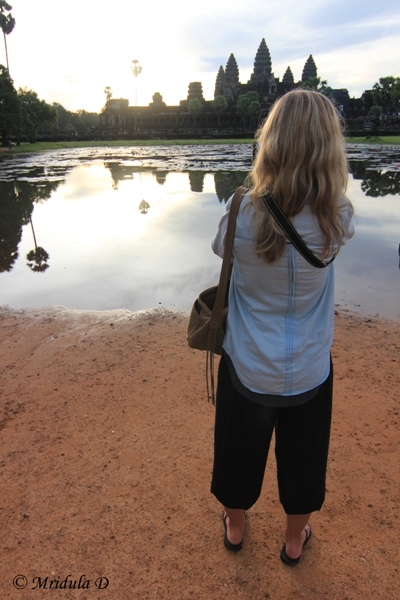 At Angkor Wat I saw almost everyone covering their knees and shoulders. And that is all they expect when you visit the temples. Coming from India it is not a difficult dress code for me to follow. Other than the temples, all kind of dresses are fine. 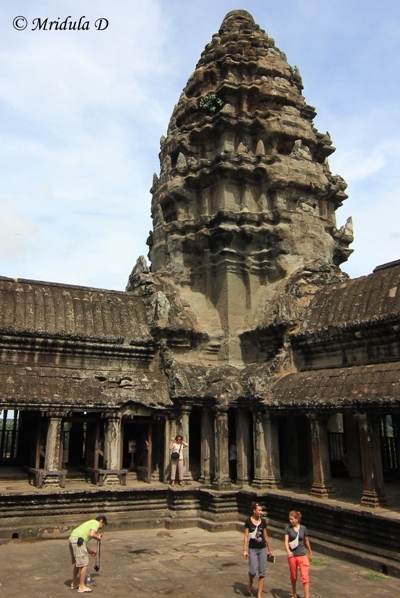 In conclusion, if you are visiting the temples (and who will not visit them when in Cambodia?) the expectation is to cover the shoulders and the knee. Outside the temples people dress up like tourists! 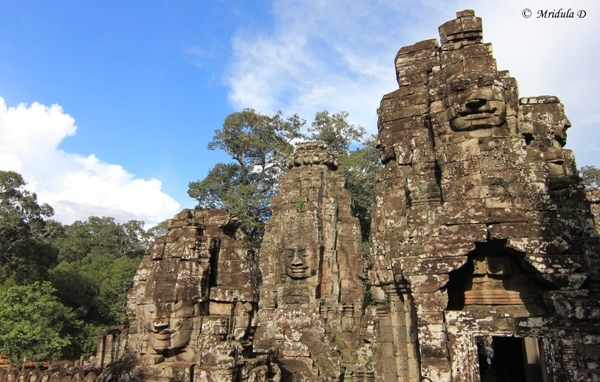 Bayon and Ta Prohm temples seemed to be much more relaxed about the dress code. I personally all the time covered my knee and shoulders when I visited a temple. As I said before, coming from India it is anyway not difficult for me at all.